Growing cantaloupe is one of my favorites about summer gardening. I don’t grow a lot of fruit in my garden the rest of the year but growing cantaloupe is a MUST for our family. The great this is that growing cantaloupe is fairly easy once you have the right information; my tips will get you on the right path to an amazing harvest! Who’s ready for a sweet cantaloupe for your summer fruit salad??? For growing cantaloupe I’m going to touch on soil, location, varieties, caring for your growing melons, harvesting and storage. Cantaloupes thrive in warm, sunny locations. Ground temps should be at least 70 degrees before you plant your seeds. If you’re in a colder region you can start your cantaloupes indoors; but you’ll want to transfer them before they get too big for best results. Be sure when you’re planting that you leave room for the growing vines to come. If space is limited considering building a trellis for the vines to grow on vertically. You can grow cantaloupe in containers as well, again with a trellis for vertical growth. Make sure to use a large pot and consider using a smaller variety of melons. If you do trellis make sure you choose a heavy-duty material for your melons or it is likely to break under their weight. You may want to consider using a cow or cattle panel. Remember that your cantaloupe crave WARM soil so don’t plant too early! Cantaloupes are heavy feeding so the soil you plant them in needs to be prepared with that in mind. You’ll need to amend your soil with organic compost, aged manure or a organic fertilizer; this should be added to the first 6 inches of soil for best results. Plant your cantaloupe at least 36 inches apart in traditional gardening. 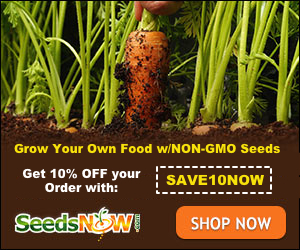 If you’re going to use a trellis the recommend spacing is 12 inches or in Square Foot Gardening 1 plant per square. I do not plant mine in mounds using raised beds but I have seen this advice for traditional planting. After you’ve added seeds or transplants you should put mulch down. Mulch will keep the new plant warm, help to contain moisture and prevent weeds from chocking out the new plant. Cantaloupe do have some pests of concern: squash bugs attack the foliage and squash vine borers will munch your vine and often kill the entire plant. You may also find cucumber beetles will attack all parts of the plant. And of course your friendly (ha) aphids are known to attack the leaves from time to time. Your best defense is giving your melons companions from the start that help them fight pests. Both Nasturtium and Tansy flowers can help to ward off pests as well as Dill. See more on Companion Plants. Keep a close on your vines, leaves and flowers and deal with any pests before they multiply! I recommend inspecting them a couple times per week. Watering is the most important part of keeping your cantaloupe growing strong. The need a constantly moist soil, but not drenched; you do not want your soil to dry out! Do your best to deliver water to the base of the plant and avoid soaking the leaves which can cause fungus and spread disease. You’ll want to use drip irrigation or a soaker hose for best results, it is not recommended to use a sprinkler. I prefer to water my melons early in the morning, giving it plenty of time to soak up the moisture before the afternoon sun dries it up. Don’t worry if your leaves seem to wilt every afternoon, this is perfectly normal. I like to add more compost or an organic fruit fertilizer as a see the first fruits developing. You may also want to do this as the plant’s growth increases, if you see it’s production or growth stall. Protect your newbie fruit as it develops. If it is on the ground you’ll want to gently put a piece of cardboard or melon cradle under the fruit. This will help to prevent pests getting to it and help to promote even ripening. If you are going to grow in containers you may want to consider a smaller variety of melon. I had good success with the Minnesota Midget, though I didn’t find it as sweet as larger varieties. This cantaloupe is perfect for one person to enjoy and fits right in the palm of your hand. 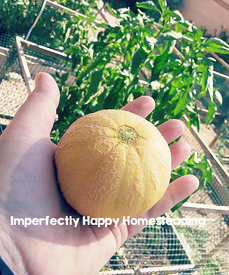 The key to good, sweet melons is letting them fully develop on their vine; picked melons do not ripen much after they are picked. To make sure your fruit is ready to be picked you’ll want to make sure the rind has changed from green to the tan/yellow you expect of a cantaloupe. Then give the baby a sniff. Does is smell sweet and ripe? If it does you should be safe to pick. To maximize your melon’s sweetness you’ll want to leave it on the counter for a day or two before eating. You can store your melons for a week or 2 in the fridge. For longer storage you can freeze cantaloupe or make preserves (it is not recommended to can them, though I know people that do). I have heard that pickled cantaloupe is quite good, but I haven’t tried it myself. Melons are our preferred summertime dessert, so we rarely have any left to “preserve”. Great post, this is my first year being successful and I just counted 16 mellons growing!!! So excited!! Very helpful! I’m growing my cantaloupe in an Earth box and it is going crazy! I was told to cut off excess fruits so that there were only 2-3 per vine. Is that correct? Also-how big can I expect my Honey Rock cantaloupe to get? The few that have started to get the tan texture are still able to fit in the palm of my hand. Is this normal? Thank you so much!! 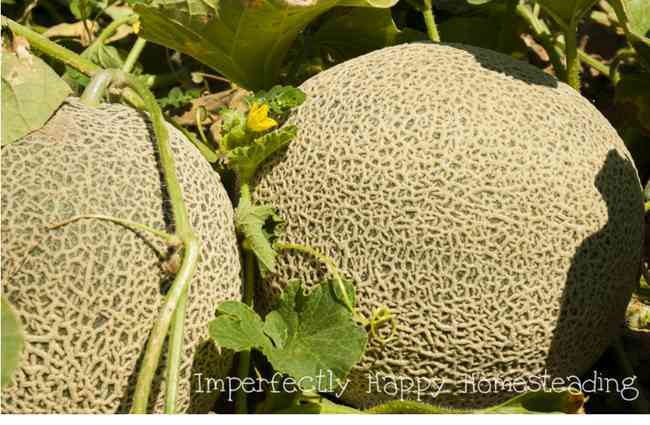 Do cantalopes look like round watermelons before they change color? I guess that would be a fair description, depending on the variety. We don’t have the variety, unfotunately. The leaves are kind of heart shaped and the melon itselt is at least 8-9 inches round right now, and looks like a striped watermelon. Well you may have some cross pollination but sounds like you may have gotten the wrong seeds. Do you remember what they looked like? It was a plant that we got from a yard sale that was selling various plants from their nursery – we got some tomatoes a watermelon and the cantalpe – none actually had any marker other than the marker in the various sections in the greenhouse. Early this afternoon I went to check on my cantelopes and found one with round holes chewed into it and and another with a split in the skin . What could this be slugs or squirrels? Without seeing it my first thought is not enough water. I’ve never grown in a hydroponic system.